In the upcoming G20: what issues are at stake? Ordinarily everything is in place for the grand transnational meeting of the 20 major world powers (G20) that is supposed, many say, to reduce the tension behind the promises, according to permanent principles of opening and transparency, or to move forward in a tenser world, for others. 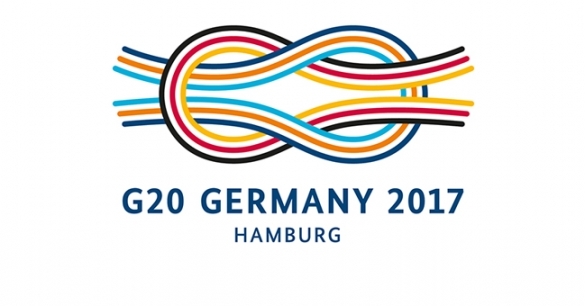 On 7th and 8th July in Hamburg, German Chancellor Angela Merkel, whose country is presiding over the G20 this year, will be hosting the G20 leaders after China last year. 19 countries , plus the European Union , will meet for talks, representing two thirds of the world's population and 80% of its GDP. Which economic themes will be privileged during the G20 in Hamburg? The G20 agenda, which will be quite traditional, covers three themes: building economic stability and resilience, sustainability and assuming responsibility. As always it will start with the economic and financial strengthening of the world economy against potential shocks. Indeed the economy has not really recovered from the 2008 crisis. Productivity is not rising very much, which exposes us to economic relapses and weakness. The aim of the G20 is to move forward promoting more and better cooperation - notably from the financial point of view, to enable and monitor flows of capital, strengthen banking regulation, notably shadow banking. Along those lines, we will find the usual themes of transparency and fairness in world taxation, more development in international trade and investment, training and private employment in an inclusive economy, the climate change, sustainable growth, the digital economy, migration, gender equality, terrorism and corruption. A big list. How will the G20 meeting in Hamburg be different from that in Hangzhou in 2016? The meeting in Hamburg is designed to follow the path set out in Hangzhou. This very first Chinese G20 was also the last of President Obama, and the idea was for it to be a success, notably with the joint signature by China and the USA of the COP21 on the climate. The press release at the time was a large document full of multiple cooperation commitments. We cannot be sure that the meeting in Hamburg will be similar, such is the speed with which the world is changing, with more regional and religious tension and above all more "changes" at the top. This G20 will be Donald Trump's first. What positions might we expect on the part of the USA? The unknown that lies before us will indeed be the attitude adopted by Donald Trump, if we recall the difficulties experienced at the G7 in Taormina (26th and 27th May last), notably regarding the climate - which led to the withdrawal of the USA from the COP21. This unknown is all the greater in this G20, since not only is the number of participants higher, and therefore the stakes greater, they are all the more different, with countries at different stages of development. We can guarantee nothing, since there will be tactical games and everything is being prepared between influential players and networks. The USA has changed a lot since last year notably from an international point of view - as they now put their own immediate interests first. In addition to this there is China - as it pursues quite clearly its international strategy for a new Silk Road  and also as it reduces domestic freedoms. The world is a tenser place and the drop in oil prices and those of other raw materials is threatening many countries. So we know that questions about trade, taxation, financial security, the climate, migration and terrorism will be particularly difficult - it means agreeing on a text that is both concise and engaging. A series of scenario are possible in this G20 in which no one has an interest in confrontation. But we do know that the American strategy will be against that of many other countries from the point of view of global warming that is happening now, banking surveillance (Donald Trump is already relaxing control in the USA), migration and the fight to counter terrorism (of which he is the spearhead). It would however be too simple to polarise the G20 around the USA, even though there is the risk of seeing America leave the WTO (after having left COP21? ), given that the problems are more complicated than before and that the weakening of international cooperative dynamics is weakening us all. What are the important points in this G20 for the European Union? In this context the EU mainly stands united regarding the fundamental issues that the G20 addresses, even though it is obviously not a homogeneous bloc. This philosophical unity and that of its interests is in line with the G20 approach and that is its strength. The main thing is therefore not to increase internal tension within the Union - it should be quite the opposite –but to strengthen trade and cooperation, to stimulate growth within the G20, whilst ensuring that there is fairness and reciprocity in the agreements. The important points for the European Union as part of the G20 entail strengthening growth within a stable and as resilient a framework as possible. Alongside these traditional discussions regarding trade and capital flow - which have to be encouraged if they are balanced and transparent - and regarding tax competition, if they do not undermine the fiscal base and do not encourage the disappearance of profits (Base Erosion and Profit Shifting, BEPS), the European Union will be involved in discussions over terrorism, migration and relations with Africa. The German presidency has invited the President of the African Union and that of the NEPAD (New Partnership for Africa's Development). Here we find the same concerns that led to the invitation of African leaders to the G7 in Taormina. What kind of role can the European Union play in the G20? In this context Europe has to make its weight felt. We can count on its numerical presence: 5 members (3 countries plus the two Presidents of the European Council and the Commission), plus Spain and the Netherlands as guests. Norway, a European country is also invited. Of course there are differences - including over Brexit, but the joint stakes are also important. The European Union evidently needs stronger, especially more transparent, equal, regulated safer growth. Problems linked to terrorism and Africa are more serious and closer to home. It is therefore to be hoped that the EU will get its messages across, which incidentally are those closest to the central message of the G20. This does not mean being unrealistic but it involves fundamental economic, political and social coherence. In short the G20 has to be a success with and for Europe. Today, Europe needs us ! By supporting the Robert Schuman Foundation you are helping Europe to bounce back, find the strength and ideas it requires to overcome the challenges ahead. This is why we need your support ! A unique document with 200,000 subscribers in five languages (French, English, German, Spanish and Polish), for the last 12 years our weekly Letter provides you with a summary of the latest European news, more necessary now than ever before.